Immunization helps protect kids (and adults) against sometimes deadly diseases like measles and pneumonia, and a few not so deadly diseases that are still pretty annoying, like chicken pox. August is National Immunization Awareness Month. This month, Activ Doctors Online Medical Director Dr. Howard Zahalsky joined us for a webinar to talk about the importance of immunization. Before they were called immunizations and vaccinations the were called inoculations. There are references to inoculations as far back as 1500 BC in India. There they were considered religious rights and were most likely intended to ward off evil beings, rather than diseases, but the results were the same. The fist vaccination, as we know them, was the smallpox vaccine. In 1798, English physician Edward Jenner noted that milkmaids who caught cowpox seemed to be immune from smallpox. It turned out, a small amount of cowpox would teach your body to defend itself from smallpox. The Latin name for this cowpox virus, varioulae vacciane, is where we got the term vaccination. Originally it only referred to the smallpox vaccine, but in 1881 the famous doctor Louis Pasteur expanded the definition to refer to all inoculations. The first measles vaccine, a repetitive vaccine designed for children, was developed in 1963 and has been improved in subsequent years. The number of shots children receive has dramatically increased in just the past few decades. Back in 1983, children were only getting about 10 vaccines: DTP (Diphtheria, Typoid, Pertussis), OPV (polio), MMR (Measles, Mumps, Rubella). Today, children receive between 36-38 shots. Some of the same things, you just get more of, like MMR. Why? Doctors found that 93% of people are immune after their 1st MMR but 97% are immune after another shot. Then we’ve added rotavirus, pneumonia, and hepatitis A & B… and that’s all by age 6! There are additional shots, like the human papilloma shot, that kids will need when they get older. All vaccines based on the same mechanism. In the vaccine, an antigen – which is “doctor-speak” for something that your body will recognize as an invader – is introduced to the body. 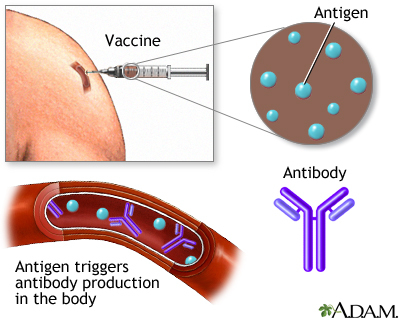 The antigens in vaccines are either deactivated or incomplete, so your body will see the antigens, recognize it as an enemy and create the antibodies – proteins that act as soldiers and attack foreign invaders. That way, should the real virus enter your body, the lightbulb will go off – “I remember that guy!” – and they will create the appropriate antibodies to fight off the virus. A virus, whether it is polio, chicken pox or measles, has a similar structure – a protein shell protecting a DNA core. A whole deactivated process is the virus shell with the DNA removed. A live attenuated virus has been treated so that it cannot actually hurt you. 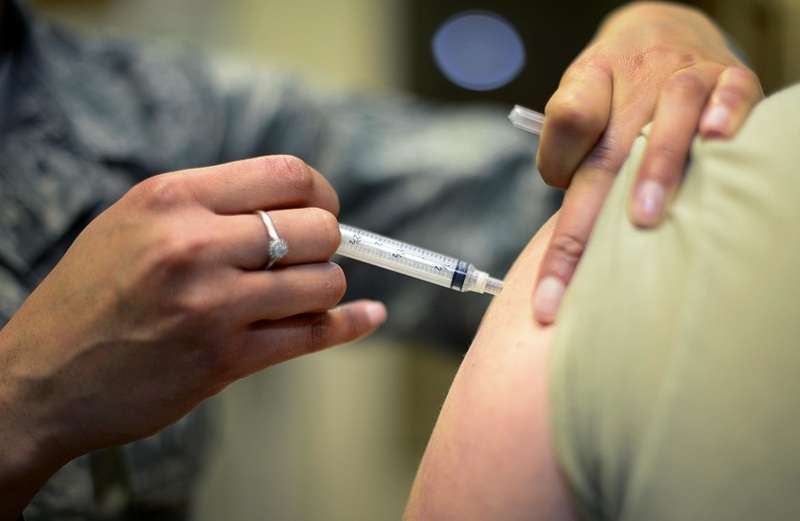 The flu shot is an example of a live attenuated virus. Very rarely these viruses can un-attenuate (reactivate) themselves, which is why, sometimes, you get the flu after your flu shot. For that reason, there are very, very few vaccines in use today that are live attenuated. Other vaccines simply use pieces of the protein and DNA, just enough to teach the body to recognize a virus. Before the polio vaccine, there were over 13,000-20,000 cases of paralytic polio in the US, mostly in children. Before there was a measles shot, measles used to be a right of childhood – everyone go the measles. And it usually killed 450 children each year. Before we developed a pertussis (whooping cough) vaccine, it killed 12,000 children each year worldwide. No vaccine discussion would be complete without discussing this controversy: do vaccines cause autism? Autism is a developmental disability where children have problems with socialization, communication and empathy. While we are now able to identify the children affected by autism, we still do not know the cause. The concern about autism started about 10 years ago when a group of parents came together and noticed that shortly after getting measles, mumps, rubella (MMR) vaccine, they developed a fever and socialization language skills seemed to profoundly decrease. They cited a 1997 study by British surgeon Andrew Wakefield, published in a prestigious medical journal, suggesting that the vaccine was increasing autism in British children. This caused a nationwide concern that something in the MMR vaccine caused autism. In particular, there was a chemical in the vaccine called thimerosal. Thimerosal contained a certain type of mercury, and mercury poisoning in adults looks surprisingly similar to autism in children. Since then, there have been a number of studies that compared thimerosal and thimerosal-free vaccines and there was no discernible link between thimerosal vaccines and autism. So why are people so convinced that autism appeared after getting their shot? In 1980, 1 in 10,000 children were diagnosed with autism. Today, it’s 1 in 50. 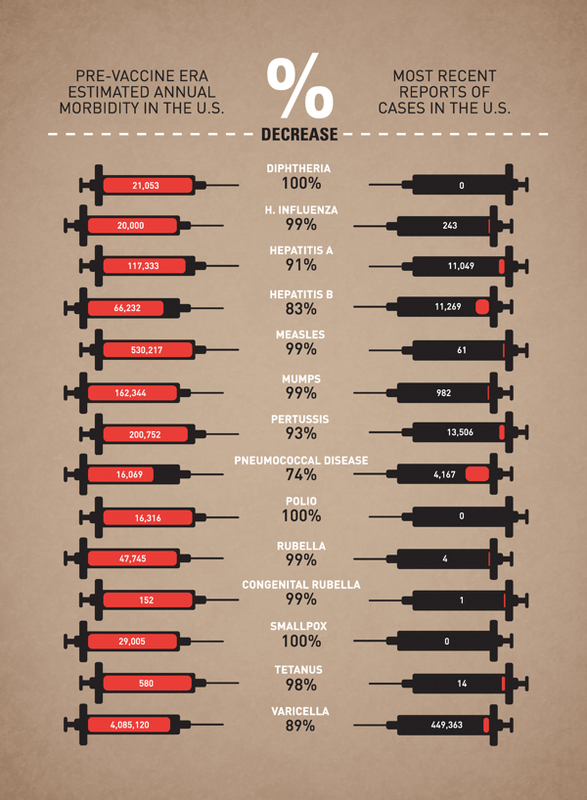 At the same time, the number of vaccines has also dramatically increased. Could it be related? “You can never say never,” cautions Dr. Zahalsky, “but, there is absolutely no scientific evidence to back that up.” The rise in autism could, in fact, simply be related to increased awareness, so people recognize and diagnose it more frequently. Despite the dramatic decrease in disease, paralysis and death since we started vaccinating, there are some people that still fear the effects. 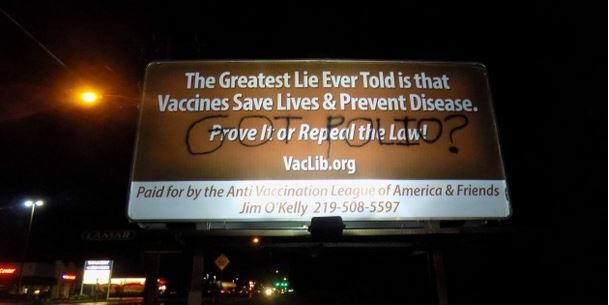 Some states, for instance, California, have made it optional for parents to vaccinate their children. This fear of vaccination and subsequent opting out caused a dramatic uptick in measles infection in the past year. The dramatic rise of measles infection centered around an outbreak at Disneyland. Remember, the MMR vaccine is only 97% effective even after 3 shots. So why is it so effective? It’s called herd immunization – if everyone gets vaccinated, even if it doesn’t work for 3%, the chances of running into someone that has it are significantly lower. When increasing numbers of peoples opt out of vaccination, thinking that their child is safe because “everyone else” is vaccinated, the population loses the protection of herd immunization. The result is what happened at Disneyland. “I cannot tell you how many people I have had to re-vaccinate because they needed proof of vaccination but the last time they got vaccinated was at their pediatrician’s 10 years ago and their pediatrician has retired and it’s just too hard to track down the records,” jokes Dr. Zahalsky, “They would just rather get another shot that they don’t need.” With Activ Doctors Online’s Personal Health Record, losing old records is never a problem. Let Activ Doctors retrieve the old records for you and you will have the records in a secure system that will always be there. No extra shots required! If you do come down with any strange disease, whether preventable or not, you can request a Second Medical Opinion from one of our thousands of medical doctors and specialists. They can give you their opinion using the records that are already in the system. If you are concerned about vaccines, and you are a participating member with Activ Doctors Online, you can have an e-Consultation with an expert Physician. This allows you to connect with a doctor from home, via webcam, rather than driving all the way to the office for an answer to what could be an simple question. India’s Aspirations for Universal Health Coverage – Ray of Hope? can not imagine simply how a llot time I had spent for this information! Thanks!